I decided, to hit a couple of spots today today since the weather was predicting snow in the forecast for tomorrow. My first stop, was at the Salt Marsh Nature Center in Brooklyn, where I tallied a total of 35 species with the most notable being a male Redhead Duck. My second stop, was at Floyd Bennett field, which for the most part was quiet...though I did get about 65 horned Larks out on the cricket field. 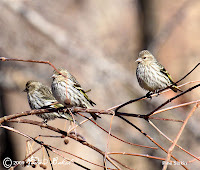 My last stop was at Alley Pond Park; this was my first time out at that location for the year and the most notable sightings were Pine Siskins and both resident Great Horned Owls. 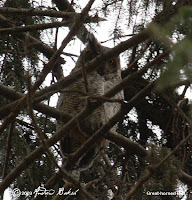 Sadly, it appears that the Great Horned Owls are not nesting as the female would have been sitting on her nest instead of flying about. 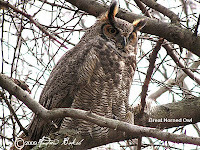 Since it is late in the breeding season for Great Horned Owls, it may be that we will not be seeing any Great Horned Owlets at Alley Pond Park this year. The small Ross' Goose in the middle. I had tried several times in the past for the Ross' Goose at Big Egg Marsh, but had struck out until this morning, when after an hour of waiting, the bird came into view. 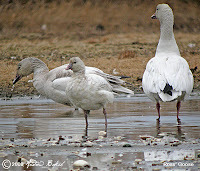 This was not an easy ID because the goose happens to be an immature and looks a lot like its cousin the Snow Goose. However, once I got looks at the beak, grin patch and neck, I was sure that I had my prize. Several photos later of the goose by itself and a comparison shot with its cousin sealed the deal for me. A follow-up with a few other birders confirmed that indeed it was a Ross' Goose. Following, my visit to Big Egg Marsh, I stopped at JBWR, and walked the West Pond Trail; not much action...though, I did pick up the usual winter species including a Great Egret on the West Pond and several Hermit Thrushes in the North Garden. Today, I headed out to Pelham Bay Park for a scheduled Owl walk with the Urban Park Rangers. Arriving around 10:00 a.m. I birded Twin Island for a bit and picked up several of the usual species including, European Starling, Blue Jay, Red-bellied Woodpecker, Carolina Wren, Song Sparrow, Mallard, Brandt, Ring-billed Gull, Red-breasted Merganser, American Wigeon, American Black Duck, Killdeer, Bufflehead and Mute Swan. Around 1:00 p.m. I joined a hardy group of 9 additional birders at the Nature Center and met our guides, rangers, Carrero and Melvin. Our first stop was to scope some rocks out in the Long Island sound where we picked up around 10-12 Harbor seals. Once we all had good looks, we headed to Hunter's Island in search of Owls. Our first Owl stop and search was in the stand of majestic Norway Spruces. 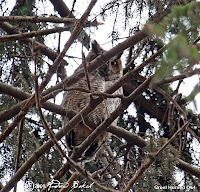 Our group was pretty alert and it was not long before a Great Horned Owl was spotted. We all gathered at the site and got our bins and scopes on the subject. Owls are very special and I cherish every sighting that I get and this was no exception. I was very impressed at how cooperative this Great Horned was with the group as we were able to spend a few minutes observing and taking photographs. The Owl was pretty high up in the tree, which was expected and getting clear looks were not easy, but I think overall, the group was very satisfied with what they were able to see. 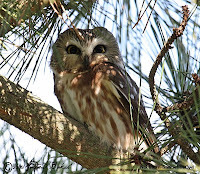 Our next Owl stop and search was in the stand of Eastern White Pines, and while we saw several pellets, we could not locate either the Saw-whet or Long-eared Owls that are known to roost in that location. We wrapped up our walk around 2:30 p.m.; despite the steady drizzle and missing on a few species, I thought the day was well spent. The Urban Park Rangers, were excellent hosts and did a very good job of managing the group and everyone's expectations. Lastly, I especially enjoyed the story shared by one of the other birders in the group who recently saw White-winged Crossbills. If you have been following my Crossbills escapades, then you would know that I am still in search of this elusive bird and so listening to the story, I vicariously shared their moment. Today, I assisted on an NYC Audubon cruise out in the New York Harbor in search of winter water birds and seals. Our group consisting of over 50 attendees boarded a NYC water taxi at pier 17 (South Street Seaport) around 11:15 for the two hours trip. 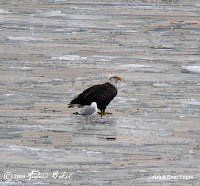 We saw many winter birds including, Ring-billed Gull, Herring Gull, Greater Black-backed Gull, Red-breasted Merganser, American Black Duck, Greater Scaup, Bufflehead, Long-tailed Duck, Double-crested Cormorant, Great Cormorant, Red-throated Loon, American Wigeon, Mallard and Purple Sandpiper for a total of 14 species. 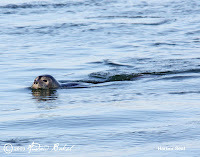 In addition, we also saw one Harbor Seal around Swinburne and Hoffman Islands. Following the cruise, I headed back to Queens and stopped off at Forest Park (waterhole), to see if I would be lucky enough to get photos of the Common Redpoll, that I had found last week. I had nice looks of several species, including Pine Siskin and American Goldfinch, but no sign of the Redpoll. I did not spend a long time at the waterhole, as the light was fading and so, I will have to try another day. Considered the harbingers of Spring, the sounds of Red-winged Blackbirds are permeating in the garden. I counted as many as, 14 around the feeders and accompanying them were several Brown-head Cowbirds. The usual Winter species continue to show, with a nice addition of another Red-bellied Woodpecker seen around the suet feeder. Unfortunately, I unable to determine if it was another female or a male, as the resident female drove the intruder off. Also seen in large numbers in and around the garden were, Boat-tailed Grackles. The accipiters continue to hunt in the backyard; I have seen both the Male Sharp-shinned and Female Cooper's Hawks recently and they both looked in good shape. With the weather being decent over the past weeks, it may that an Early Spring is in order and if correct, then maybe I should start to get some yard work done sooner rather than later. 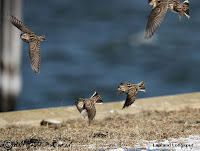 Today, I was scheduled to co-lead a bird walk at Jamaica Bay Wildlife Refuge with Don Riepe. Since, I wanted to try again for the Barrow's Goldeneye, I decided that I would get there early and bird before the walk, which was to begin at 10:00 a.m. I got to the refuge at around 8:00 a.m. and I was already ruing that I was late because I really wanted to be on site at 7:00. 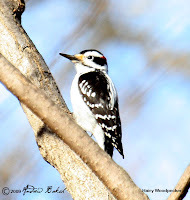 Another birder, Doug G. arrived just as I did and indicated that he had received a phone call from another birder Steve W., who had already seen the bird and it had left the West Pond around 7:45. This was not what I wanted to hear, but remaining positive, I headed out to the trail. As I got to bench 9, I noticed Doug had set up his scope and was looking out into Pumpkin Channel, there was hope yet, I thought because just from the gesture of the other folks with Doug, it appeared they were looking at something intently. I walked up to the group and noticed one of the Jones Beach boys, Sy S. I immediately asked if they had struck gold and the answer from Doug and Sy was in the affirmative; in fact Doug had me look right away in his scope and I saw the Barrow's. I then got my scope on the duck and had good looks. I tried to do some digiscoping in an effort to get a decent image, but the subject was just too far out in the bay and the surf was rough making it very tough to get any decent photos. After having my fill and sharing my scope with other birders who were arriving in the hopes of seeing the Barrow's, I checked in with Don, who had just arrived at the refuge. It was almost time for the walk to begin and so I headed back towards the refuge. I met Don just at the beginning of the West Pond Trail with about 35 people in tow. We came back out towards the trail I had just left and made it as far as bench 1, where we saw Green-winged Teals and Hooded Mergansers. However, Don decided that it was too cold and windy for the group and so we headed back towards the East Pond. Around the East Pond, we saw several water fowl , including Buffleheads, Common Merganser, Greater Scaup and Rudy Ducks to name a few. We wrapped up our walk around 12:30 and headed back to the refuge. Species seen including my solitary birding include, Barrow's Goldeneye, Common Goldeneye, Red-breasted Merganser, Bufflehead, Rudy Duck, Gadwall, Green-winged Teal, Hooded Merganser, Common Merganser, Canada Goose, Brandt, Northern Shoveler, Sharp-shinned Hawk, American Black Duck, Mallard, Ring-billed Gull, Greater Scaup, Mute Swan, Double Crested Cormorant, American Coot, Snow Goose, Northern Mockingbird, Red-winged Blackbird, and Yellow-rumped Warbler for a total of 24. Once back at the refuge, I ran into Steve W. again, who indicated that he was heading to Forest Park, to look for Siskins. 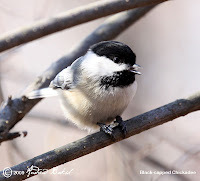 I decided to go with him; it was a worthwhile trip as we saw several species, including Pine Siskin, Black-capped Chickadee, White-breasted Nuthatch, Yellow-bellied Sapsucker, Red-bellied Woodpecker, Tufted-titmouse, Fox Sparrow, Song Sparrow, Dark-eyed Junco, Downy Woodpecker, Hairy Woodpecker, American Robin, White-throated Sparrow, Northern Cardinal, Northern Mockingbird, Common Redpoll (a rarity), Red-tailed Hawk, Mourning Dove, Blue Jay, Carolina Wren, Winter Wren and American Goldfinch for a total of 22. With today's walks, I picked up several "First of the Year" and that allowed me to break the century mark...not bad for just February. Yesterday, I went out to the Jamaica Bay Wildlife Refuge, looking for the Barrow's Goldeneye that was reported on the 10th. While I could not locate the Barrow's, I did see some nice looking Common Goldeneyes...both Drakes and Ducks. Also, I did pick up another first of the year in Northern Shoveler and had good looks at Pintails in the west pond and also in Pumpkin Channel. A nice surprise for me was two Ring-necked ducks that I spotted around the point of Terrapin Trail. This is the first time that I have seen Ring-necked ducks at Jamaica Bay Wildlife Refuge; in reviewing the bird checklist, the species, is not even listed as a winter visitor, so this was a neat find. 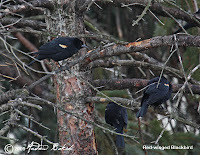 Another nice sight was the 12-14 Red-winged Blackbirds that I noted around the West Pond trail; this is a definite indication that our early spring migrants are returning. Today, I went out to Jones Beach, as I continue to hope for a White-winged Crossbill before they move on. While I did not get any Crossbills, I did find my second Snowy and Northern Saw-whet Owls of the year. Out on the Jetty around West End 2, I did get looks in the scope of Long-tailed Ducks, Common Loons and Horned Grebes. 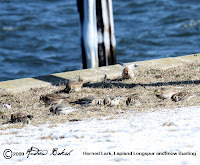 In addition, I did see a few Snow Buntings, but now that the snow is all but melted, they were scattered and not concentrated in small areas like they were a few weeks ago. Despite battling a cold, I joined Joe Guinta as his assistant and along with 34 birders boarded a bus heading to Croton point where we were going birding as part of the "Eagle Fest." Our main objective was to see the American Bald Eagle and if possible pick up an Owl or two. We left a little bit after noon and by birding standards, this was late. However, our strategy for leaving late was we reckoned on staying out towards dusk in the hopes of spotting "Short Eared Owls" as they ventured out to hunt. We got to Croton point in about an hour and headed over by the train station, where we immediately picked up several Eagles. We had three scopes with us and that enabled us to allow everyone in the group to get good looks at the Eagles, that were perched in branches on the other side of the shore. 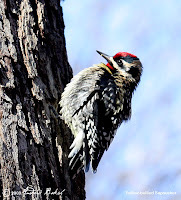 We had excellent looks at One Adult and two immatures in the trees. 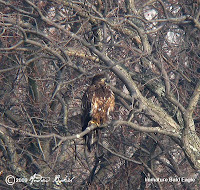 As we stood there in awe, two other adult Bald Eagles flew in and we got looks at those as well. 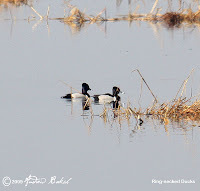 Once the group had their fill of the Eagles in the scope, Joe and I began scanning the water for additional water fowl and Joe quickly pointed out Common Mergansers (male and female) ...a little bit later, we both picked up a nice find..."Ring Necked Ducks." The group had good looks of both species as well as a white tail deer that showed up for a drink. We then boarded the bus and went into Croton State Park. After parking, we walked the hills and went looking for other birds. We spotted several different species, but no Owls; nevertheless, we ended up with a total of 31 species sighted. A planned trip up north across the border was put on hold for a number of reasons, with the weather and exhaustion being just a few of the factors. 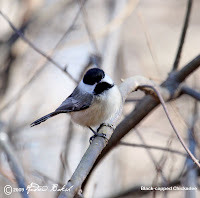 A few of us who had our hearts set on going out decided that we needed a full day’s worth of birding to make up for the disappointment and so we settled for Barnegat. Barnegat Inlet, located in NJ, is renowned among birders as a great spot for waterfowl and provides excellent opportunities for good bird photography. We left Queens NY around 9:30 a.m. and arrived at Barnegat around 12:30 p.m. Along the way, we had seen Turkey Vultures, Starlings and Red-tailed Hawks. Once in the parking lot, we grabbed a quick bite in the car then unpacked our gear. We made sure we were bundled up with our coats, hats and gloves; after all, this was winter birding and it would be cold near the water. We headed towards the walkway past the lighthouse and immediately, saw Red-breasted Mergansers. Walking a few yards along the walkway, Denis and I spotted a Harbor Seal…my second seal in a few weeks as I had one recently at Floyd Bennett field. Scoping the opposite shore, I picked up numerous Long-tailed Ducks, Surf Scoters, Black Scoters and Common Loons bobbing up and down in the surf. Clambering over the rails, I headed onto the rocks of the jetty; by now, Don and Denis had already moved onto the rocks and were headed towards the tip. 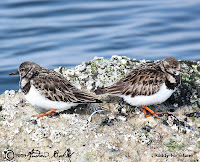 Barbara and I, who were taking our time, had a nice encounter with 6 Ruddy Turnstones who flew in and perched on a rock giving us fantastic looks. 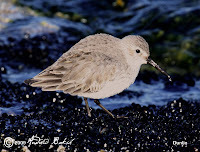 Making my way across the rocks, I spotted Black-bellied Plovers and Dunlins hanging around the shallow pools of water caught in rock cavities. On my right near the shore, Sanderlings were scurrying along ahead of incoming waves only to chase the receding waves in search of stranded invertebrates. Near the edge of the rocks, I came upon a Black Scoter, hanging out with Long-tailed Ducks and I was able to get some photos. Don who by now had reached the end of the jetty, called me on my phone to let me know that he and Denis had come upon a nice flock of Harlequin Ducks. I increased my pace on the rocks and soon came upon the flock. They were close to the rocks and we were able to get really good photos of them. We continued shooting for a while before heading back along the jetty. Don and I ventured into the dunes in search of Ipswitch sparrows, but we did not land any. 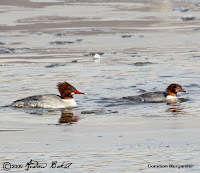 I went back onto the walkway and continued photographing Red-breasted Mergansers; while there, the seal (assuming it was the same one spotted earlier) put in another appearance and this time I was able to get photos. We headed back to the car around 3:30 p.m. and were contemplating searching some pine groves for Owls; however, we learned that the lot was being closed for the day, so we decided to call it a successful trip and headed back home. The consensus was the trip was worth it and another day at Barnegat may be in the works sometime soon. Needing a first of the season, I made a trip out to Jones Beach in the hopes of landing Lapland Longspurs. 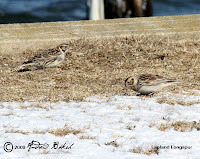 I felt I had a good chance, as the Jones Beach boys, Sy and Joe, had reported on the 4th, seeing around 15 of them in a flock of Snow Buntings and Horned Larks. Pulling into the Coast Guard Station, I immediately located the flock and after scanning, with my bins, spotted a couple of Longspurs. Having the scope was an added bonus, as I was able to scope the flock very carefully and counted about 12-15, which was a nice number to have around and the most that I have seen in one place. Despite the wind and cold...and it was brutally cold...feeling like below zero! I was able to get some photos. It is not often one gets to capture different species in one composition and so I was quite happy to get this photo of Horned Larks, Lapland Longspurs and Snow Buntings. It makes for a good study on how to differentiate the species when they are flocking together. On Sunday, I assisted Gabriel Willow with an Audubon walk at Floyd Bennett Field and Fort Tilden. 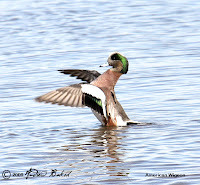 I got to Floyd Bennett Field around 8:30 a.m. and began birding on my own. I was in a way scouting the area before the attendees arrived, so I would know what was around and be able to allow people the chance to see as many species as possible. My first stop was around Archery Road and there I got looks at Common Goldeneye, Great Cormorant, Red-breasted Merganser, Greater Scaup, Bufflehead and Horned Grebe. From Archery road, I moved on towards the cricket field, where I got a flock of about 52 Horned Larks, 30 Canada Geese and 2 Dark Morph Snow Geese. After spending a few minutes scoping the Larks unsuccessfully for a Longspur, I moved on to the Boat Ramp; on my way, I scanned the grasslands for the Meadowlarks that I know are over-wintering, but did not see any. At the Boat ramp, I saw many of the same species I had seen at Archery Road and also a few additions, in American Wigeon, Red-throated Loons and Common Loons. While watching some Horned Grebes in the scope, I had a nice surprise and the first for me in that location...a Harbor Seal. The next stop was around Raptor point, where I picked up Song Sparrows, White-throated Sparrows and may of the species that I had already seen. Along the way, I had numerous fly byes of Northern Flickers, Yellow-rumped Warblers and Northern Harriers. By that time a few hours had passed and around 11:30 a.m. I got a call from Gabriel indicating that they had arrived. I joined the group and we basically went back to most of the places that I had already covered. 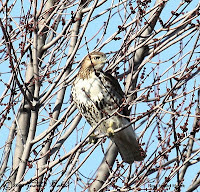 Our highlight was spotting several Red-tailed Hawks kiting over the North-forty trail and we had good looks at one such immature Red-tailed that was being mobbed by crows. After lunch, we decided to head out to Fort Tilden and there we did another hour of birding mostly on the beach scanning the surf for water fowl. The surf was rough and made it quite a task even for scoping, but we did get nice looks at Red-breasted Mergansers, Red-throated and Common Loons, Long-tailed Ducks and 3 fly by Snow Buntings. We wrapped up the walk around 4:30 p.m.; I think the group was pretty happy with the species we saw. We ended up with around 34 species.